This new residential project is set on a huge plot of 50,000m2 which is bordered by a wonderful cork oak grove. The development consists of 102 contemporary style homes and exceptional communal areas. It's conveniently located close to the entrance to the exclusive La Reserva golf resort and is only 2 km from the International School at Sotogrande and 4 km from the marina and beaches. Sotogrande is the largest privately owned residential development in Andalusia. It's approximately 40km from the bustling Marbella and belongs to the municipality of San Roque, Cádiz, in the Western Costa Del Sol. Much of Sotogrande sits back into the foothills of the Sierra Almenara and a contrast of views including sea, hills, cork forests, green fairways, the Rock of Gibraltar and the Atlas mountains of Morocco. Some of the wealthiest and most influential families of Spain and Europe have summer homes in Sotogrande. There are three types of home available;The Garden House, The Roof Garden and The Penthouse. 14 of the 15 buildings comprise 7 units each: 4 Garden House apartments, 2 Roof Garden apartments and one Penthouse. Building no 15 is made up of 2 Garden House apartments and 2 unique top floor apartments that enjoy a huge solarium of 165m2. The apartments have been designed in a modern and innovative style yet integrate perfectly with the natural surroundings. All properties have a built area of approx 200m2 built, with a choice of three or four bedrooms. 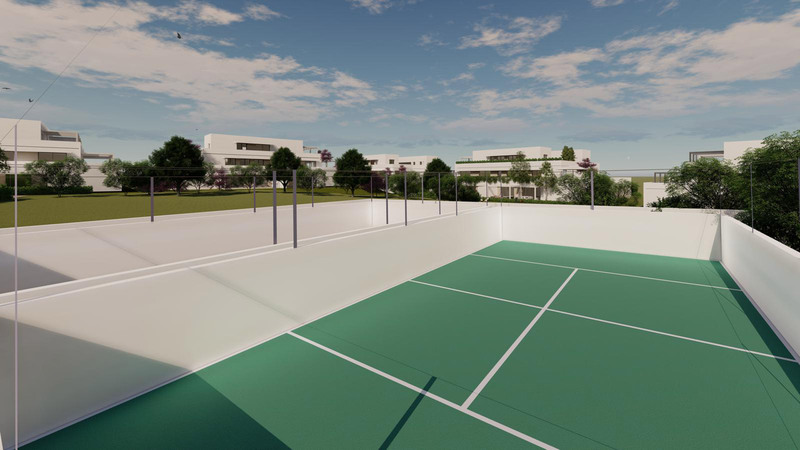 The generous communal areas include a pathway through the attractive cork oak grove, a security and concierge point, paddle-tennis courts and a large outdoor communal swimming pool. Underground parking with 2 spaces for each property also creates a quiet and peaceful car free environment.